How Many Calories Are in a Banana Split? 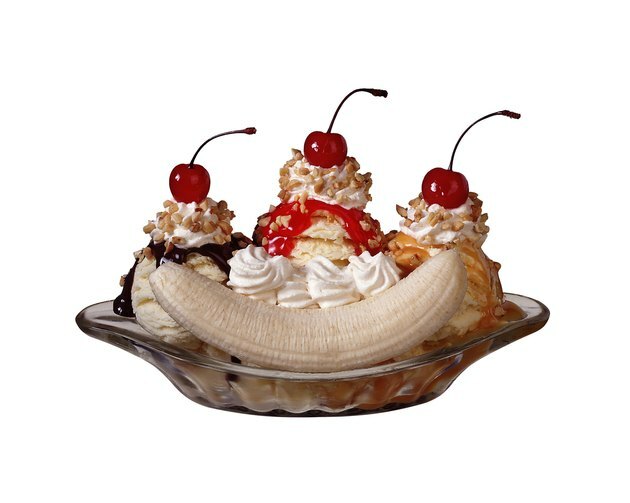 Banana splits are often landmines when it comes to nutrition. A single banana split can be upwards of 1,000 calories and pack more than 30 grams of fat. You can make some easy adjustments to improve this dessert's nutritional profile, but you still might want to reserve it as treat rather than a diet staple if calories are a concern. By far, the healthiest component of a banana split are the bananas, which are high in potassium and several vitamins, including vitamin C. A medium banana contains about 105 calories. The centerpiece of a banana split is typically the ice cream. A medium scoop of ice cream contains about 137 calories with 59 calories from fat and 46 calories from sugar, according to the U.S Department of Agriculture. The exact number of calories can vary depending on what kind of ice cream you're eating and what flavor it is. Usually, a banana split contains three scoops of ice cream -- or 411 calories. Chocolate syrup contains about 52 calories per tablespoon, while hot fudge rings in at 74 calories per serving. This is an average. The actual number varies by manufacturer. Caramel or butterscotch toppings contain about 60 calories per tablespoon. Nuts, whipped cream, maraschino cherries and sprinkles are a few other toppings that you can include in a banana split, which can also punch up the calories if you're not careful. Nuts can add more than 100 calories per 1/4 cup, while maraschino cherries add about 7 calories per cherry. Whipped cream is about 75 calories per 1/2-cup serving, while sprinkles have more than 50 calories per tablespoon. There are a lot of ways you can make a more nutritionally sound banana split. Instead of using three scoops of ice cream, consider making a banana split sundae with just one scoop. If you do this, you'll also need less of the other ingredients. Alternatively, you can use fat-free frozen yogurt, which can have as few as 83 calories per scoop, rather than ice cream. You can also leave out one of the higher-calorie ingredients, like sprinkles or nuts.